Eight long years ago, we moved into our new house. It was our very first new house …. surrounded by dirt. Visions of the Hanging Gardens of Babylon combined with Busch Gardens and watered with the fountains from in front of the Bellagio in Vegas lead me to believe that things would grow in Phoenix. 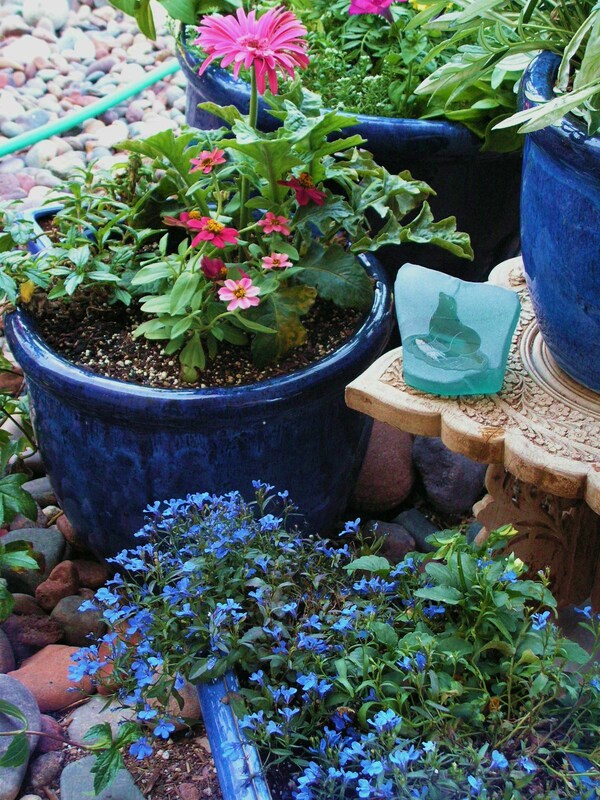 My green thumb and my gardening magazines had me waltzing barefoot over lush verdant lawn surrounded (in my mind) by vivid pink flowers in royal blue pots with hanging vines of happy sun-yellow blooms covering our block walls. Eight long years later, I have discovered the error of my ways. We planted Bob-Sod (grass), which was the wonder of the ages at that time. Little did we know that it would look fabulously lush and green for four or five years and then haunt us for the remaining years in the house. Seems that Bob-Sod is a combo deal with two types of grass… one that grows up and one that grows sideways and chokes out all other plant life in the vicinity. Unbelievable! Also in Phoenix, the Bob-Sod is our summer grass. 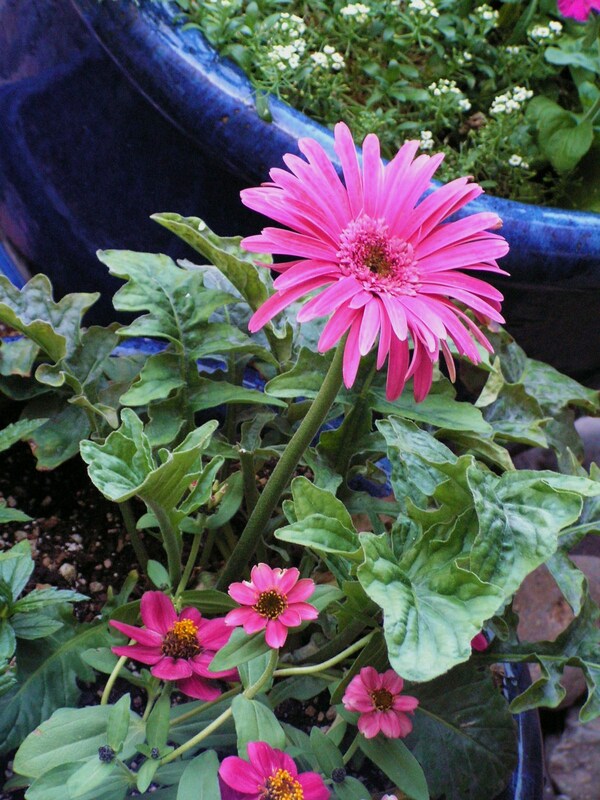 It “dies” or goes dormant for the chilly winter. So we have to plant rye grass if we want a green backyard during the season when it is actually cool enough to enjoy the backyard. This was all well and good for four or five years. Then the Bob-Sod roots got so thick that throwing down rye grass was no longer effective. Well, no longer effective for growing winter grass. VERY effective for feeding the 572 million pigeons who moved down here for the winter. With the root problem evident, a few years back we aerated the lawn. By foot. That is really close to by hand. We used the age old aerating tool that looks like a shovel but replacing the blade were two metal tubes that poked dainty hole in the lawn, presumably allowing the rye grass to grow. This was true. Sadly. Everywhere where there was a hole from the aerating tool, the rye grass grew. But that was the only place it grew. The “designated grass area” looked like a bald man who just got bad plugs. Once again, winter is upon us. We decided to kill off the Bob-Sod by not watering it for the last two months. I like to tell people we are going for the foreclosed look in the backyard. I don’t think the Bob-Sod died at all. Tonight my husband used a de-thatching blade on the lawn mower to break up the roots and prepare the soil for rye grass. It was comical and I was prepared to remember this day for all eternity with a photograph of him wearing a white mask over his mouth and nose that was scotch taped to his face, but no. A de-thatching blade on dirt simply makes HUGE dirt clouds. Dirt clouds that you can’t even see through. Nor take pictures through. When the dust settled (on everything in the backyard… and our neighbors’ backyards) I went out with the hose and feebly tried to clean things off. When I first laid eyes on this idea in a magazine, I was sold. It’s been about two years since I ripped that page right out of that magazine…. and put it in my Idea Binder. I’ve been waiting for the right chair ever since. 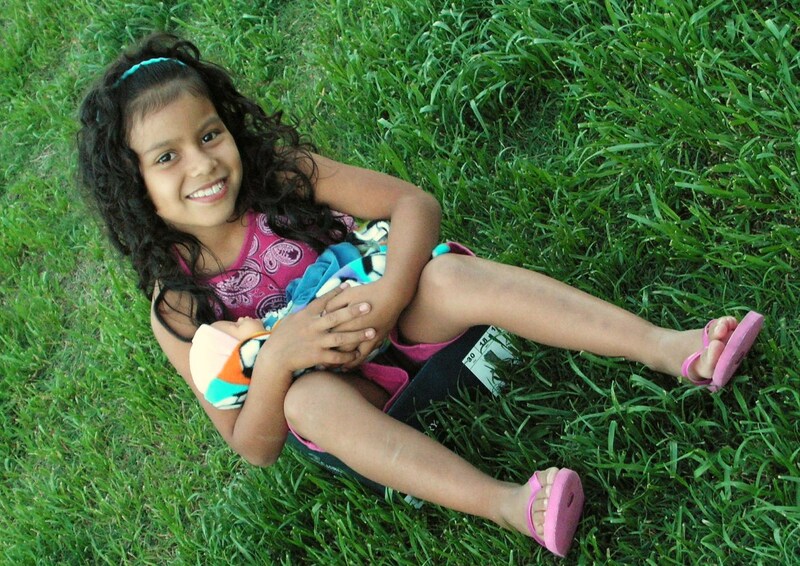 Several prerequisites for the chair were established in my mind: sturdy, wide seat, easily removable seat and CUTE! The one in the magazine was an old ladder back chair with straight lines and no frills. Fast forward to 8:45 pm on the Friday night before the 50% off sale day at Goodwill. I was preshopping the sale for the next day with my husband by my side. I spied this chair and my heart pitter-pattered a little faster than usual. 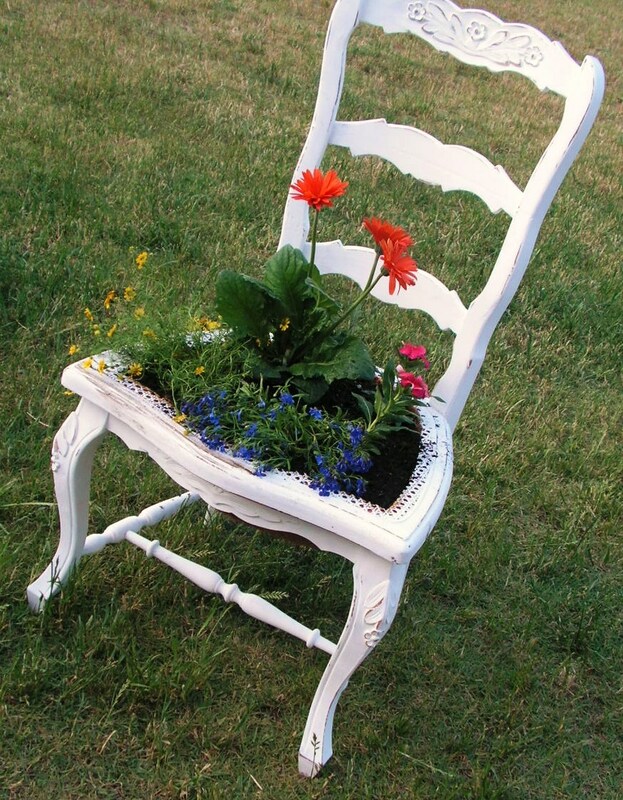 I knew it was MY chair for the flower pot idea. It had a cane seat and darling flowers carved on the legs, seat and back. The cane had a tear in it… hence the $6 price. 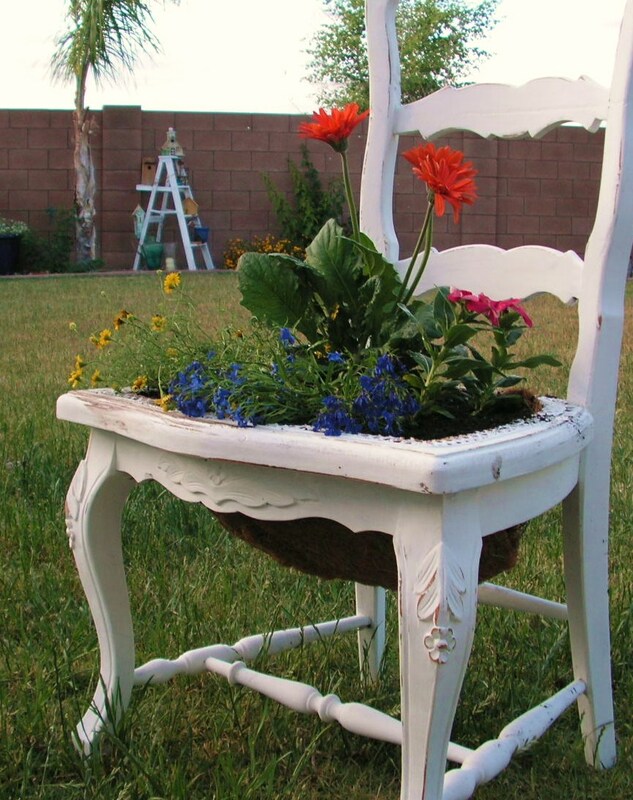 All went as planned and now I have a pretty potted chair in the backyard! For those DIY-ers, I cut out the cain seat. Painted the brown chair white. Sanded the decorative carvings. Then I stapled chicken wire to the bottom of the frame in the shape of a bowl. I bought one of those basket liner replacements that are an inch thick and made of coconut hair. I had to cut some triangles out of the edges to get it to fit in the seat. I wanted it on the patio, but it will drip everytime I water it, so it is on the rocky border next to the patio. TA DA! Sadly, I can’t even get out in the backyard every day to finish my 27 projects. Slow and steady wins the race. I know. I know. But slow and steady also leads me into the broiling temperatures of summer in Phoenix. So the pressure is on! The resurrected gazebo is coming right along…. other than being upside down, on the grass, and not painted. This is the one that flew over the fence and was a mangled mess of canvas and metal. 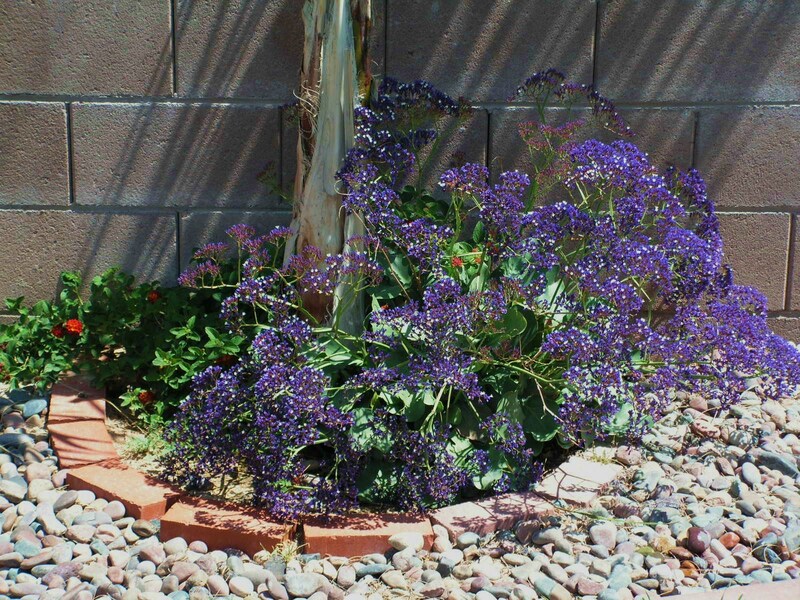 My beloved royal blue lobelia are absolutely their happiest right now…. but they won’t last much longer in this heat. The garden is coming right along…. 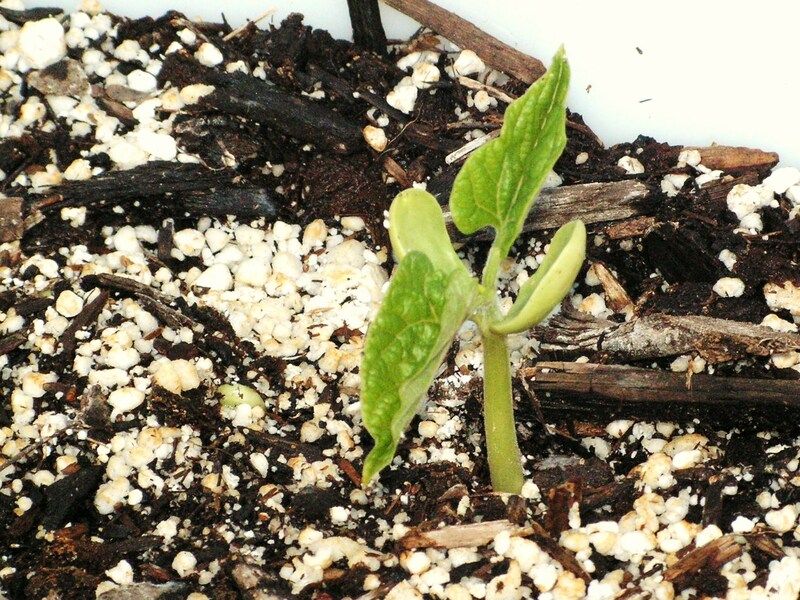 beans are winning the growing race at the moment, but the zucchini is in a close second. Lastly, for your viewing pleasure, I scored six of these lovelies at 50% Off Goodwill last Saturday… YES! Rick scrunched up his nose too at the thought of candles in the backyard, but last night I lit them all and he did think it was lovely, even though he never used the word lovely. 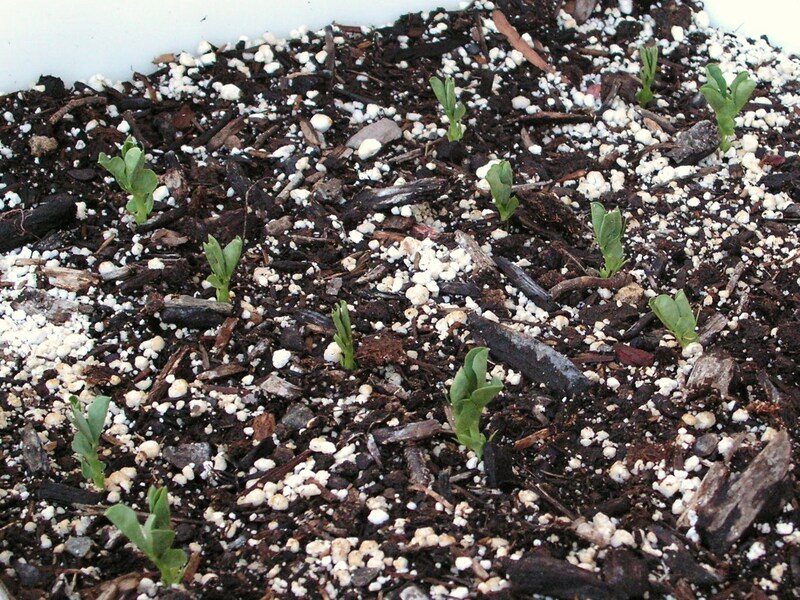 That is the spinach popping up their little heads toward the sunlight. Little peas all straight in rows. (Thankfully I could see those seeds. The carrots aren’t in straight rows at all.) Next is a cute and dainty green bean doing its thang. Those pictures were from Saturday. Here are the pictures from TODAY… only two days later! Peas on the left and beans on the right. 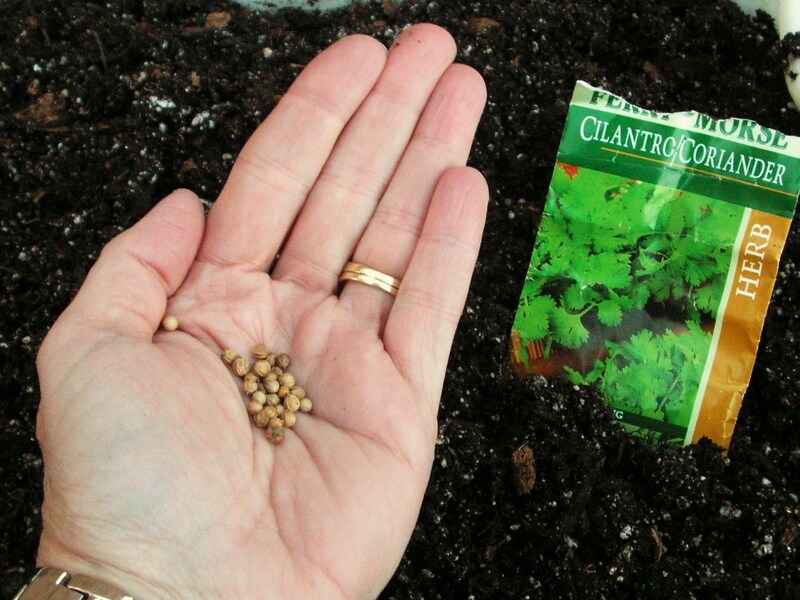 The no-man’s-land in the center is going to be peas too, but they were planted 4 or 5 days later than the rest. 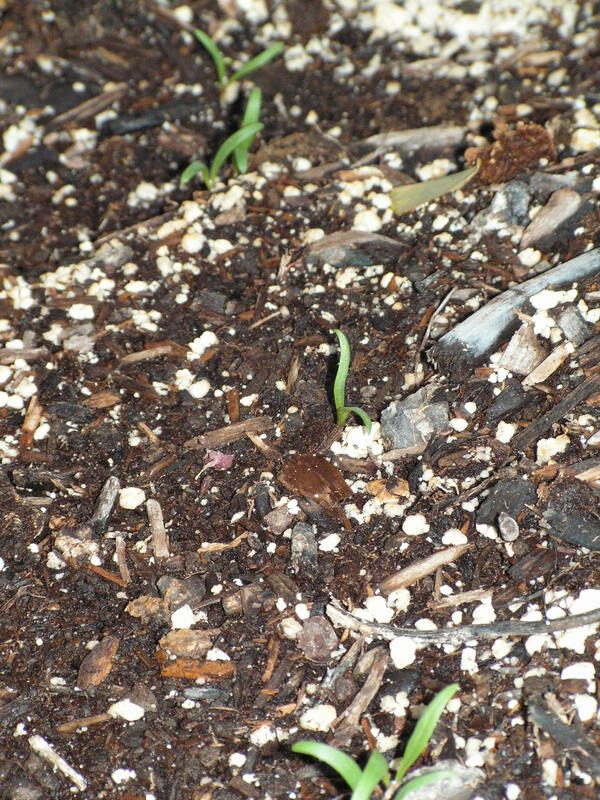 Bringing up the rear of the photo montage is the two zucchini plants…. soon to be the SOLE zucchini plant. If you have ever planted and harvested this yummy squash, you know the SECRET to raising zucchini….. you only need ONE plant per family!!! We learned the hard way, 18 years ago, when there were only two of us and we planted eight zucchini plants. I believe we lost some friends that summer after we filled their car with the prolific vegetable! Good times! My garden is 67% planted! Yeah! I ended up with six half barrels of my magic soil mix…. that includes some empty 2L bottles that I placed in the bottom of the barrels to take up space. It’s sort of like the bricks in the toilet tank… remember that, anyone? 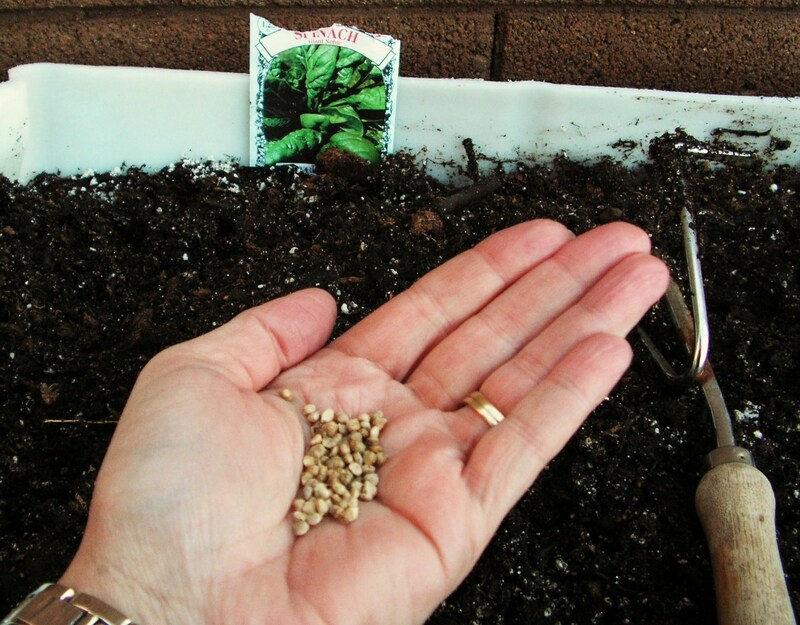 And the planting began…. green onions, bell peppers, carrots, spinach, cilantro….. 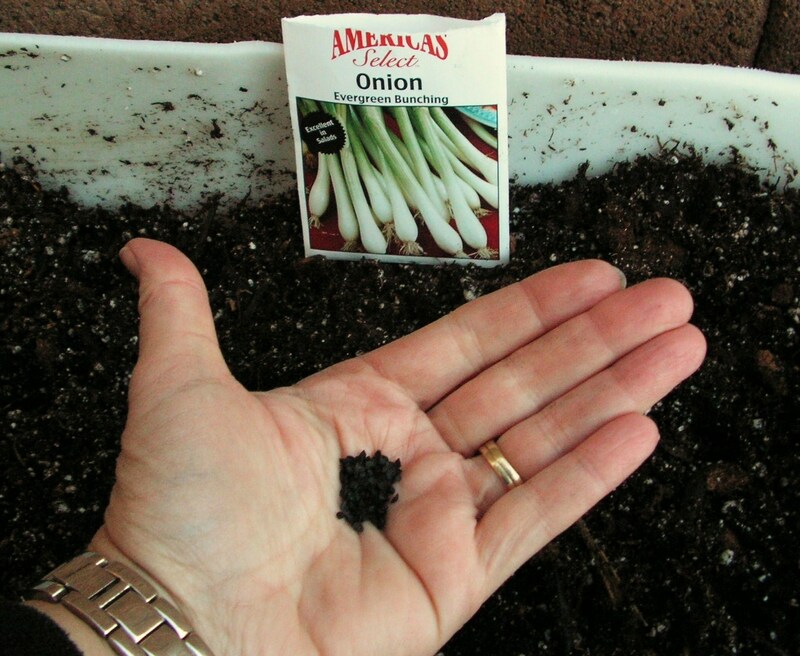 Yes, those green onion seeds are teeny and hard to plant. 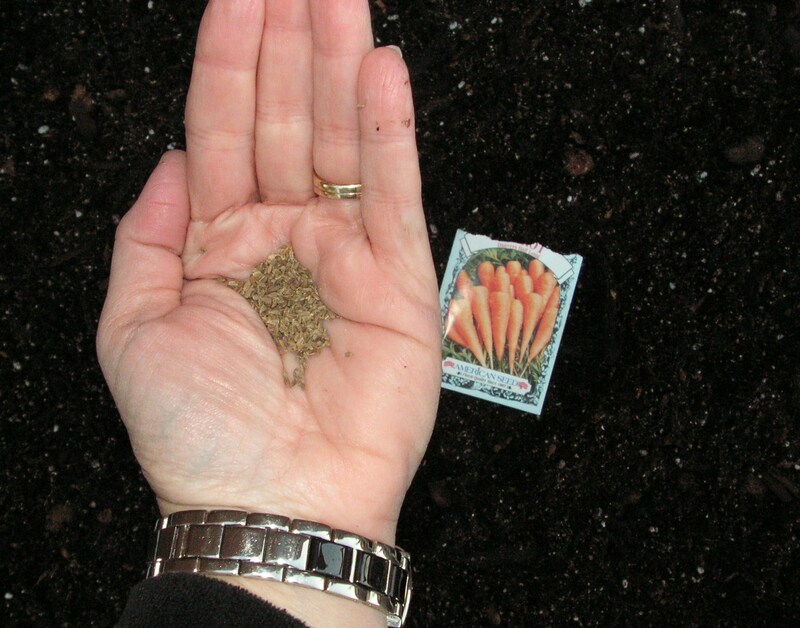 But not NEARLY as hard as the carrot seeds! I could barely see them, let alone try to pick up two at a time for each of the 96 little holes destined to cultivate Peter Rabbit’s favorite veggie! Those carrots will NOT be coming up in perfect rows like Mr. McGregor’s garden. I may have even missed an entire row…… anywho…. the proof will be in the pudding in about two weeks, when they come up and I see what really happened. The reason I’m only at 67% is because I forgot to soak the peas and zucchini seeds before planting. They will go in tomorrow with the beans. More pictures to follow as the joyfulness in my heart grows with each little sprig of green that pushes up through the earth. Yes, we are a week late, but for a good reason. Homeschoolers can take Spring Break whenever they want to! So we did school all last week while our friends played. This week, Rick’s brother, wife and daughter are in town to PLAY! It started yesterday and shall continue for another six days! WhoOoooo HOoooOOoo! Today’s business was: street hockey game, dressmaking and container gardening. Unsurprisingly, I chose container gardening. 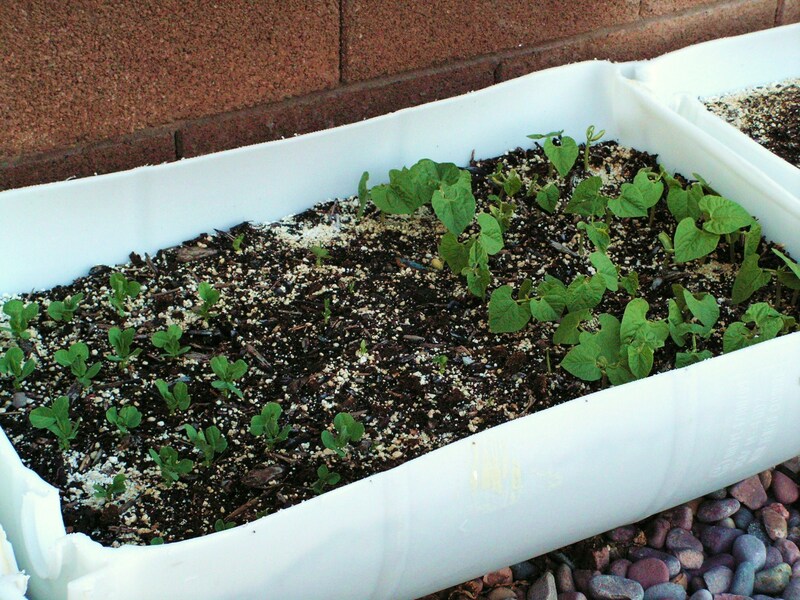 (Only because I had half of the soil mixed on the tarp when the trip to the fabric store was announced.) After much calculating and price shopping, the final mix for the ultimate container vegetable garden turned out to be: 1 cf (cubic foot) each of perlite, peat moss, compost and mulch. There are so many different mix recipes out there, I had to do my research. I do like the book The Square Foot Garden, but his mix is very expensive. So I found all the ingredients and mixed it myself, well, with the help of my two sons and my 7-year-old daughter who LOVES to help! And I added mulch. Hey, it’s cheap and adds roughage to the mix. Funniest thing happened as me and my sister-in-law were leaving the store with a flat-bed cart piled with huge soil bags….. the cart hit the first of the pavement bumps leading to our get-away car and half of the bags fell off onto the ground. As we were laughing and setting our purses down to pick them up, a lady in a wheel chair pulled up and asked if she could help. “Sure!” (I was thinking, what exactly is she planning on doing to help???) She held the cart still while we piled the bags a bit more securely. That was nice! One thing I did know was NOT to use the soil in the ground in AZ! It is the same clay that the Hohokam Indians used to make clay pots. After the sun shines on the clay soil at 120 degrees, it is as hard as a clay pot fresh out of the kiln! As mentioned before, I was given large plastic barrels that were cut in half long-ways for my containers. 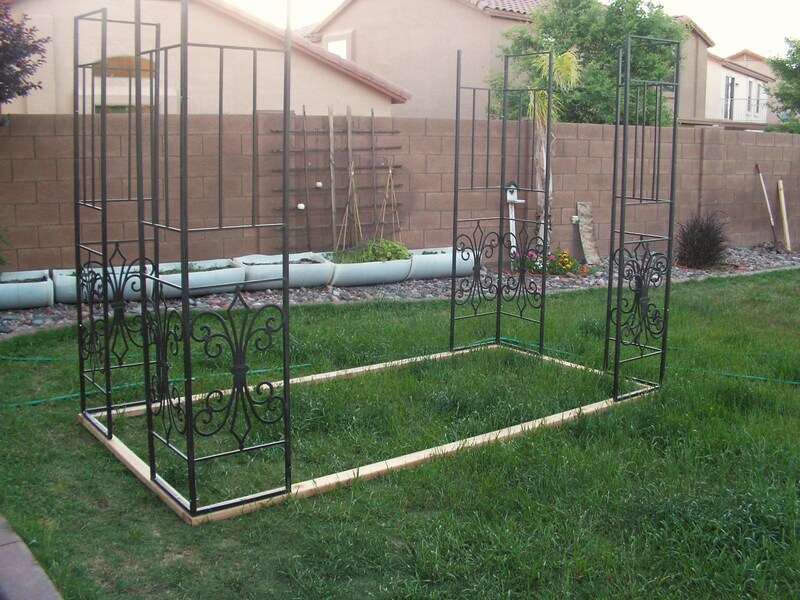 Yes, the hardware store sells cute little wooden fences for a 4’x4′ garden bed, but like I said, these were FREE! And required next-to-nothing in set up. 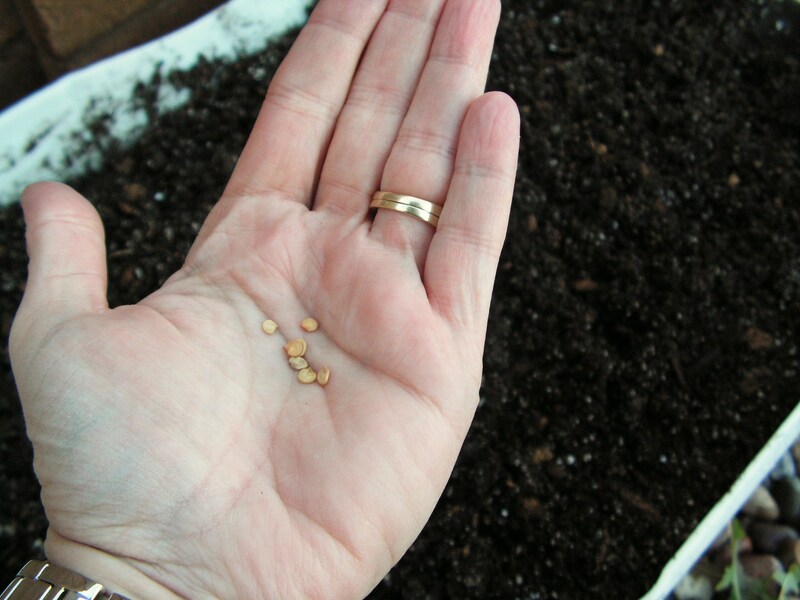 I filled six of them today with my miracle mix and will plant tomorrow. The heat and sunshine are always a concern here for wilting plants in the summer, so I lined the barrels along the west wall of our backyard, so they only get sun until 2:00. Then they can recover until the next morning sunshine kisses their little leaves again. God Cares About the Small Things! It’s testimony time. Please allow me a few moments on my soapbox to share the little surprises and victories in my life. I am a farm-girl trapped in a city-girl body and life. I’m not sure where my love for all things country came from (minus the music), but I have strong dreams and desires for raising animals, growing veggies, fruit and nuts, spinning wool and diggin’ in the dirt. We’ve had gardens in the past. We’ve raised chickens and rabbits in the past. 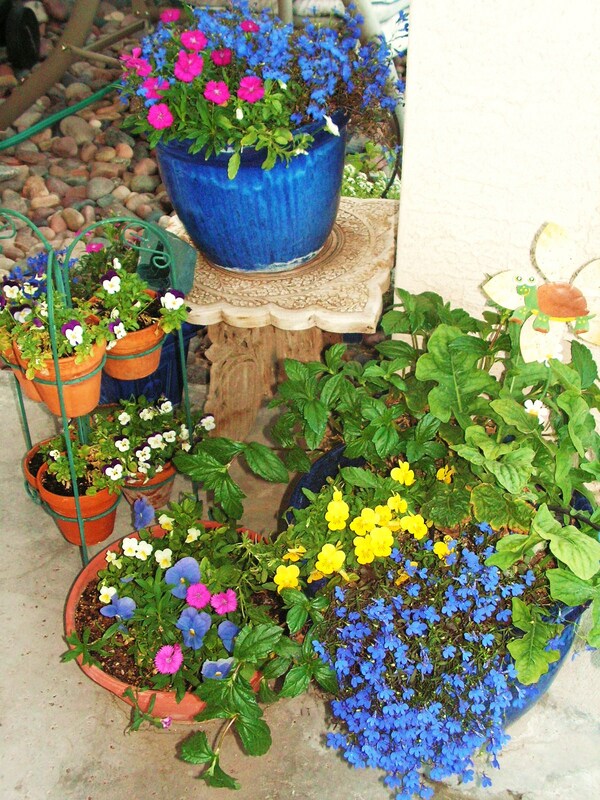 Currently I have a few potted flowering planters and a plum tree that has a promising collection of blooms. However, I’m secretly sucked into the backyard-garden section at every and all bookstores. The book The Encyclopedia of Country Living makes me drool and salivate simultaneously. Right now I have a book from the library titled The Backyard Homestead that clearly lays out how to raise all the food you need in as little as a quarter acre. This is my idea of a piece of heaven on earth! Last night after a lovely dinner at a Mexican cantina, Rick drove us through the back alleys behind some homes that sit on an acre each…. I rolled down the window and thirstily sucked in the country-smelling air. Horses, grape vines, goats, chickens, sheep, grapefruit trees…. ahhhhhhh. The slow trip in the darkness did my heart good. OK, so today we stopped by a friend’s home, that is a mile from our house, to buy farm-fresh eggs. They have horses, chickens, a lame goat, two big, fat pot belly pigs and two little two-day-old pot belly piggies. Darling! I even held one! 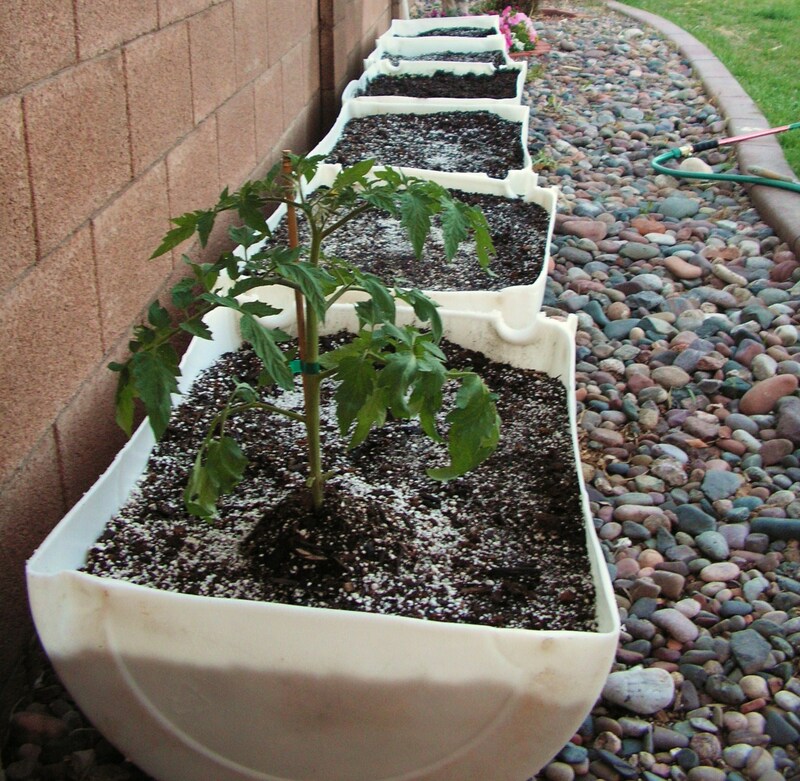 They just finished planting their garden in fiberglass barrels. It was truly lovely. It gave me ideas just to see their set up. When I got home there was a message on my cell phone from that same friend asking if I could use eight of the barrels for planting a garden. Oh, could I ever! It was an answer to an unspoken prayer! God does care about the desires of our hearts, no matter how small. Here is my beautiful new-to-me gazebo from some friends of ours. Seems they live in a communist compound five miles north of us and can’t have shade in their backyard. So my 13-year-old son and I put it together today… without instructions…. and only put four pieces on backwards. Of course they had to be removed and turned the correct direction for the cover to fit. It was only 85* in the SHADE this morning. So we were a bit glisteny and shiny. 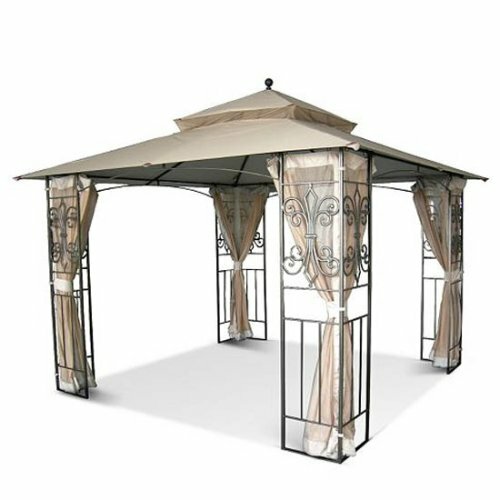 I have always wanted one of these gazebos, but it was never high enough on the priority list. Thank you, dear friends! While Aus and I were holding our arms straight up screwing nuts on bolts for what seemed like 27 hours in the hot sun, my other two children were leveling a corner of the yard which had been cleared of river rock and prepared for two 6’x6′ garden boxes. 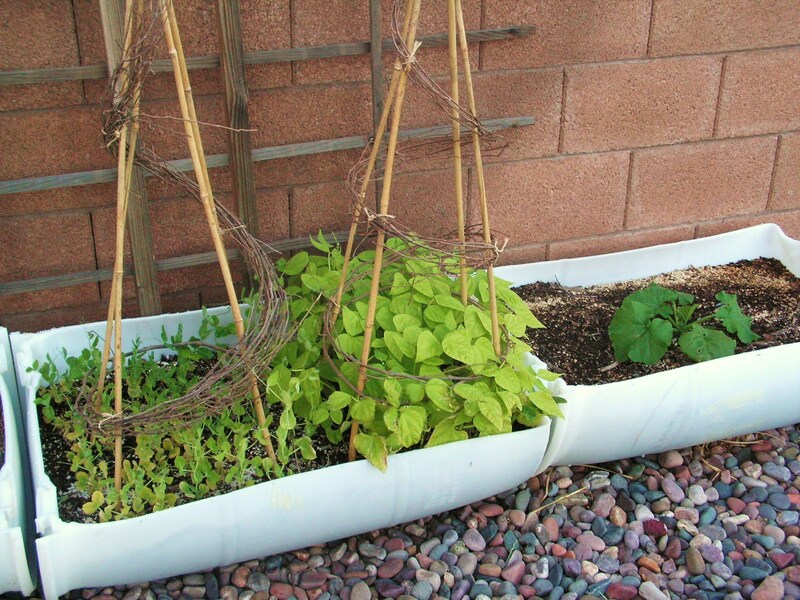 It was the logical place for gardening boxes…. but it was the ONLY place for a 10’x10′ gazebo. So my rototilled dirt was compacted and the river rocks were put back into place. The mosquito netting was hung and the gazebo was placed in the NW corner of the backyard. We promptly moved the patio swing in there and it is oh, so inviting! SHADE! The number one commodity in Arizona in the summer! 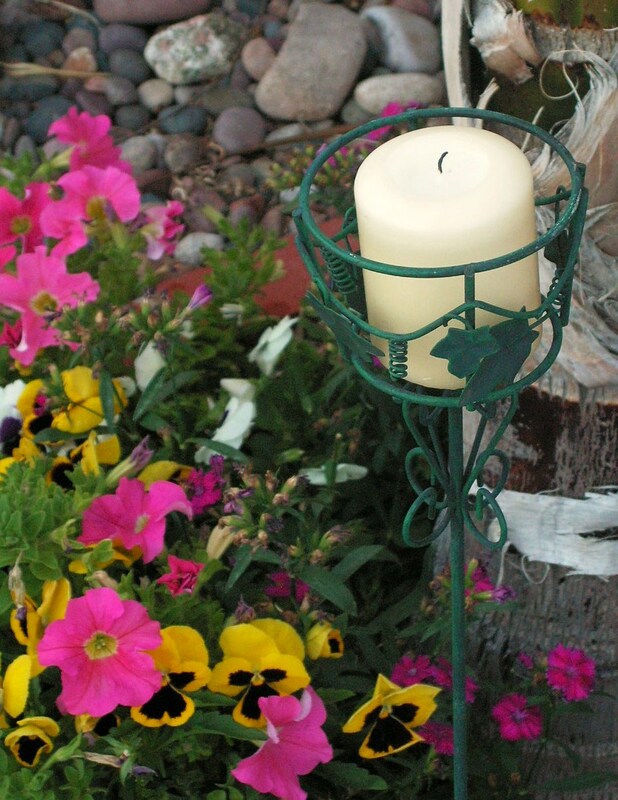 We are approaching summer temperatures, so my petunias, lobelia, alyssum and marigolds need to be yanked out and tossed and Vinca needs to be purchased and planted. I plan to move some big pots in the gazebo and then it will be complete. Ahhhhhhhh. 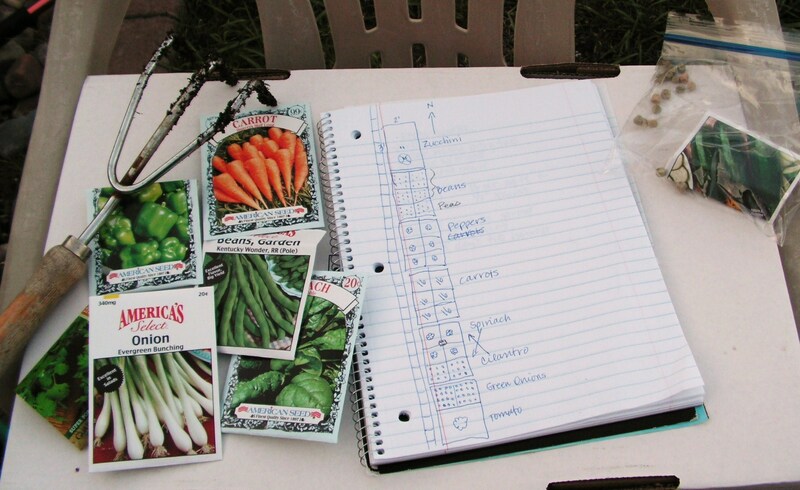 After watching Food, Inc. last night, I’ve decided to DEFINITELY plant some veggies! I pulled all my carrots this morning and there is enough for dinner! Yahoo! So no more 6’x6′ square gardening boxes. The only two places in the yard now are two 10’x3′ areas along both side walls. 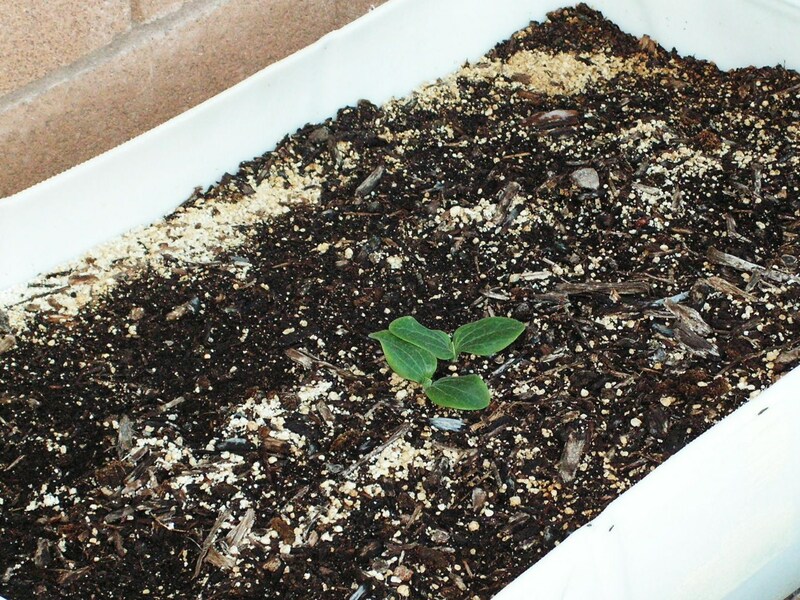 I’ve grown zucchini during the summer before and I plan to again… and pumpkins. I’ll keep you posted. The Height of a Gardener’s Disappointment! OK, this might not be the height, now that I think about worse things that my garden could succumb to, (leaf cuttter ants, grubs, mold, little white gnats, a digging dog, etc.) but still… this is pretty bad. There is a flowerbed that surrounds a Queen Palm in the backyard that I was going to leave bare until late May. 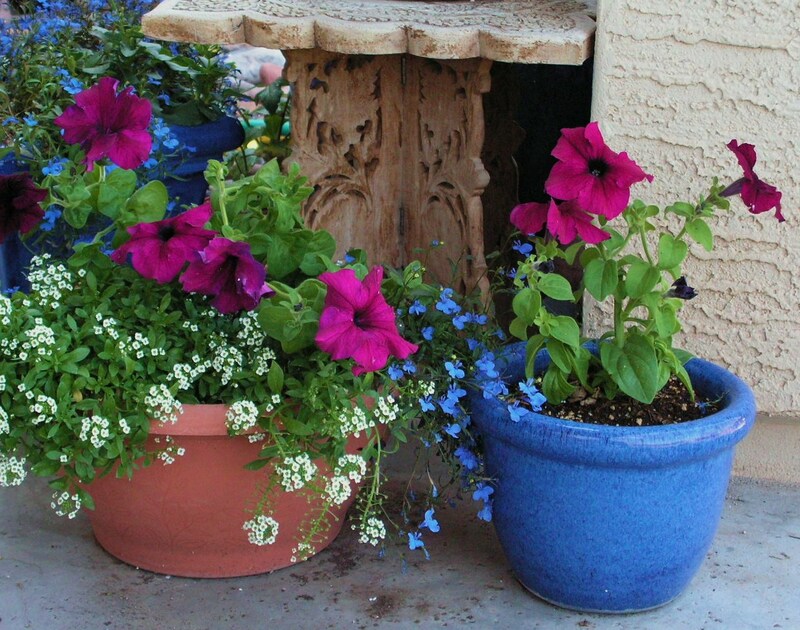 I never got petunias in the ground this winter, only in my pots. Down here in Phoenix, there is a distinct line drawn between winter and summer flowers. And NONE cross the line. Low and behold, the spot I was going to rest for a season was brimming with seeds from the previous year. 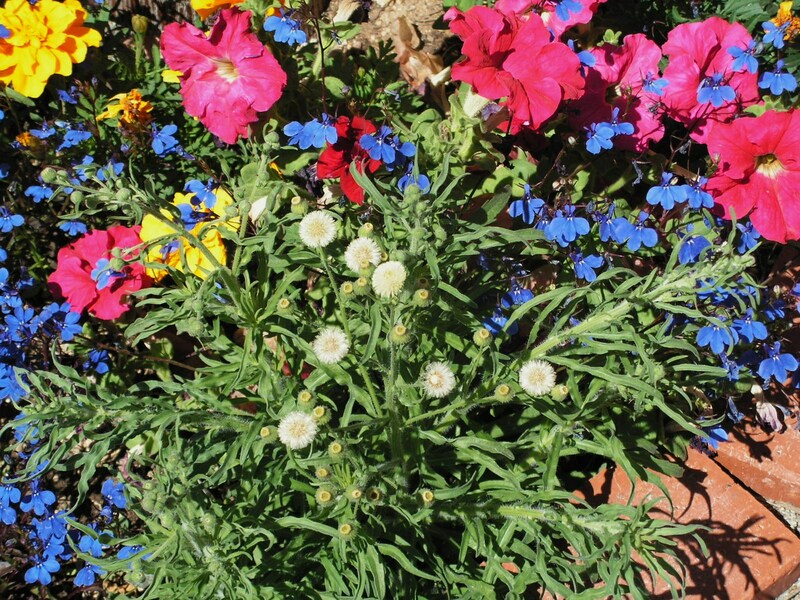 All these flowers came up on their own: Lobelia, Sweet William, Marigolds, Petunias! Sweet mercy! Mixed in the beauties were these mystery plants that I couldn’t identify for the life of me. There were four of them and they spouted the same time as all the others. So I’ve been watering them and waiting impatiently to see what they are! I suspected daisies. Funny thing was, I visited my mother and she had the same little plants dug up from around her yard and was gingerly nursing them in two different pots. She thought they were petunias, but no… I knew they weren’t because my petunias came up right next to them. So we’ve been waiting for weeks for the healthy plants to reveal their flowery heads. Yesterday they opened. Little white, fluffly, mini-dandelions. They are weeds. Really healthy weeds! Weeds that I’ve been watering and actually weeding around. Today I took this picture before I yanked them out of the rich soil, root and all. My mother is visiting my sister in Washington, so I needed to let her know what she is growing in her pots! HAHAHAHHA! Not only have I been watering them at my house, but at my mother’s house as well! I might save hers for her to see when she returns! The exceedingly good news is that there is already another bud forming….. so in May, I’ll have continual hot pink yummy eye candy to behold. April is so wonderfully warm and inviting in Phoenix…. leads to the illusion that summer might linger off in the distance a while longer! Makes me want to sit in the backyard swing and forget the laundry, the homeshooled youngin’s, cooking, cleaning, carpooling, etc., etc., etc. The name of the following flower is still a mystery. Please share your wisdom in the comment section concerning the name of said purple flower. That is all. Hasta luego.